Congratulations! 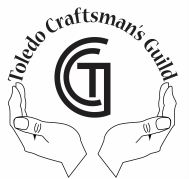 You've been accepted into The Toledo Craftsman's Guild! Now what? Here are a few items of interest that may help you on your journey. Remember...you can always ask your Member Mentor or a Board Member if you have any questions. Read the by-laws and constitution of The Toledo Craftsman's Guild. These are the rules and regulations by which our Guild must abide, including table covers, display heights, and more. If you need a copy, contact Debi Methvin, Membership Chair, at tdcr2999@netzero.net or 419-841-2999. Come to a meeting or two (or three!). Meet the Board Members. We often give away a free space to an upcoming show. The November meeting is when we hold our annual election and have a Member Social with lots of good food and fun. Send your show applications in early. Many of our shows fill up quickly. Each show is chaired and organized by different Board Members, so your space assignment will be different from one show to the next. If you like your space at a show and would like it again at next year's show, request that on your application. If you have special needs or requests (such as "away from scented products," or "near restroom"), include that information on your application. It's okay if you need to split your show fee into multiple payments, just mark your show application appropriately. Pay your annual dues on time. Your check will not be cashed until after the first of the year, so feel free to post-date your check and send it in with your annual information card.